"Endless Poetry," a new autobiographical fantasy directed and written by 88 year-old Chilean-French filmmaker Alejandro Jodorowsky, is and isn't an old man's film. It isn't in the sense that it feels like it was made with a young man's passion and egoism. Every supporting character is a reflection or abstraction that serves to enrich and support the main character's personal anarchic philosophy. All roads lead back to Jodorowsky: anyone or anything that contradicts his radical anti-capitalist, anti-booze, anti-church, anti-government, and anti-family philosophy is an obstacle in his way. At the same time, "Endless Poetry" also feels like an old man's film because it encourages viewers to see themselves through the lens of Jodorowsky's life. His teenage self (Jeremias Herskovits, and later Alejandro's real-life son Adan Jodorowsky) is largely defined by a bullish determination to improvise his way towards self-hood that makes "Endless Poetry" a more focused sequel to "The Dance of Reality," Jodorowsky's equally ambitious 2013 cinematic memoirs. 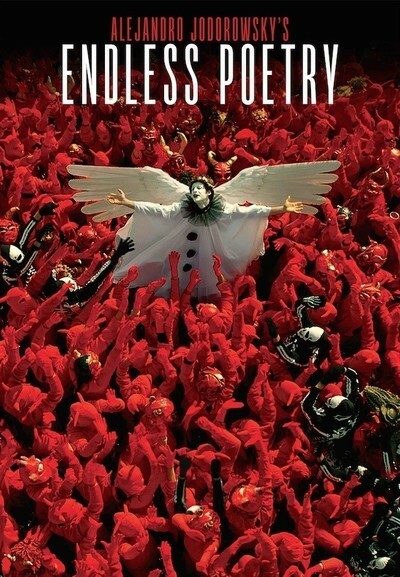 It also makes "Endless Poetry" reminiscent of "The Holy Mountain," Jodorowsky's 1973 seminal avant-garde manifesto. In both "Endless Poetry" and "The Holy Mountain," Jodorowsky attempts to shake viewers' out of their complacency long enough to begin their own spiritual journeys. The key difference is that "Endless Poetry" is a more accessible film, presumably because it was made at a point in Jodorowsky's life where he can treat the mistakes of his past as the forge that he used to shape his life's steep learning curve. "Endless Poetry" does not, unfortunately, always appear to be this complex. In the beginning, it feels a lot like a sitcom-style return to the themes, style, and humor of "The Dance of Reality." As in that earlier film, Herskovits' Alejandro struggles to break away from his domineering father Jaime (Brontis Jodorowsky, another one of Alejandro's four children). The main difference between Alejandro then and now is that he is no longer a passive receptacle of mysticism, but rather an active seeker of the sublime. First he chops down his uncle's tree after members of his hypocritically pseudo-pious extended family members cheat at cards, and mercilessly bully each other. Then he runs away from home, though this life event does not instantaneously change the broad, caricature-like humor that makes everyone but Jodorowsky's avatar look deranged. Alejandro joins an artist's collective populated by idealistic young outcasts whose outre forms of expression include full-body paintings, hammer-on-piano-playing, and dogpile-couples-dancing. The one thing that Alejandro has in common with these artists: he knows, and is determined to be an artist. For Jodorowsky, being a poet is a rebellious decision that guides the major events in his post-adolescent life. He finds new friends and lovers, like fellow poets Enrique Lihn (Leandro Taub), and Stella (Pamela Flores). His adventures with these secondary characters feel like loosely connected anecdotes that Jodorowsky frequently draws from for inspiration. They are as grotesque and surrealistic as the films of Federico Fellini, and defined by an arch theatricality that Jodorowsky uses as a signature: everything you see was man-made, and is therefore a product of the creative impulse that young Alejandro defines himself by. The film is, in that sense, Jodorowsky's tribute to himself, a celebration of everything he has become simply by staying true to himself. The fact that Jodorowsky takes seriously that cliched truism—"be yourself"—is ultimately what makes "Endless Poetry" such an infectious, unforgettable film. Through Adan, he recreates outlandish, confrontational acts in the name of poetry and artistry. Some of these acts are quaint, and funny, like when Alejandro and Enrique prove that nothing can stop them simply by walking a straight line through apartment buildings, into parking garages, over beds, and past barking dogs. Some of Alejandro's defiant acts are uncomfortably absurd, like when he beds a menstruating little person who happens to be dating Enrique. And some are genuinely sensuous, like the scene where Stella blind-folds Adan's version of Alejandro, and seduces him. These encounters are like tiles in a mosaic that adds up to an old artist's self-portrait as a young man. Jodorowsky cheers on his younger self, sometimes literally: he infrequently shows up as himself, and encourages Adan to persist, just as he did for Herskovits in "The Dance of Reality." And, with the help of his own sons, Jodorowsky crafts a world that reflects his eccentric, sometimes contradictory, but always infectious worldview. Note the way that he treats alcohol as both a soul-crushing intoxicant—served in Cafe Iris on marble slab tables by tired, elderly waiters dressed in morticians' top hat and tails—and a young man's Rimbaud-like means of opening the doors of perception (young Alejandro, and all of his artist friends drink). In real life, Jodorowsky does not drink, or eat meat. So it's fascinating to see him looking back on himself with bemused disdain: why lose yourself in drink when you could turn mundane existence into a work of art? Stop chasing after money, never get too comfortable, and always grow apart from your loved ones! "Endless Poetry" is as galvanizing as a lightning rod because it's equally accepting, and intolerant, a pro-individualist work about celebrating and cultivating yourself. "The Dance of Reality" is equally vivid, but brings to mind New York Times critic Vincent Canby's critique of Jodorowsky's 1970 acid western "El Topo," which he found to be a shapeless collection of religious iconography and apocrypha. But "Endless Poetry" feels like the product of a revitalized old master. There's a generosity of spirit, and clarity of intent that gives shape to the the film's rambling narrative, and broad-brushstrokes characterizations. The film ends with a tearful farewell, and the promise of a sequel. I can't wait for the next chapter in Jodorowsky's odyssey. At the rate that he's moving, he'll outlive all of us.